Like Dunoon? Click here to view the entire range. This beautiful mug in the Richmond shape features a design by Sue Hill which is sure to make you look forward to taking a break to enjoy your favourite brew. 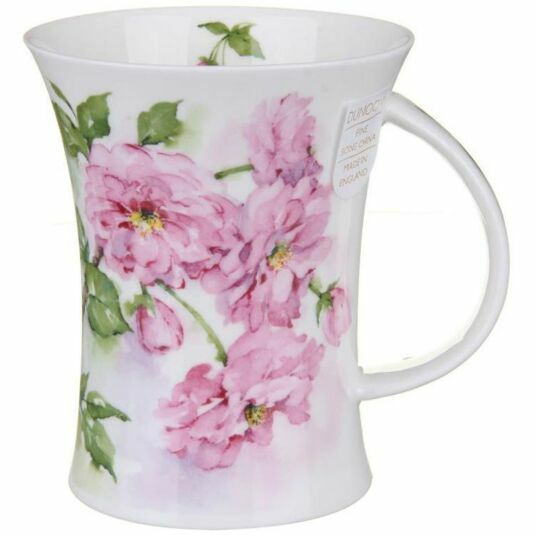 The mug is part of a collection of 6 designs, and this one features pretty Cherry Blossom flowers around the outside with a small flower on the inside. A stylish flared shape with a decorated handle, Richmond is one of Dunoon's most popular fine bone china shapes. With a capacity of 330ml they are both dishwasher and microwave safe, with the exception of those featuring gold embellishment. 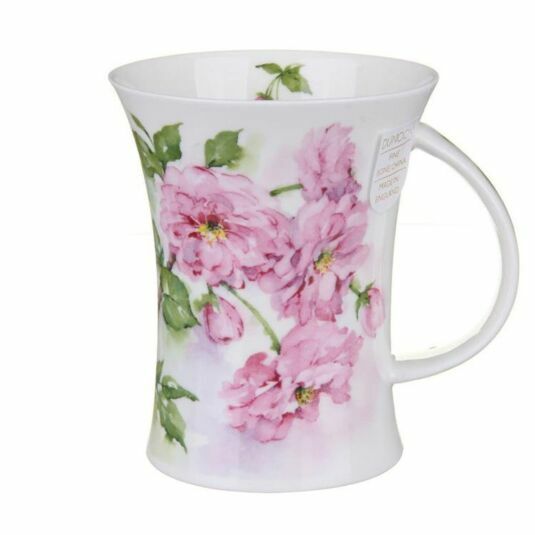 Established in Dunoon, Scotland, over 35 years ago, Dunoon are a market leader in fine bone china and stoneware mugs. Their shapes and designs are as sought-after around the world as they are here in the UK. They source the majority of their clays from Cornwall, England, as it creates brilliant white and translucent Fine Bone China, as resilient as it is beautiful. Dunoon still use traditional skills and methods to forge their mugs: their craftsmen use a process known as ‘slip casting’, which uses liquid clay as opposed to machine-made, to achieve a finished mug that is fine to the touch, light to hold and a pleasure to use. Equally as important as the physical craft of the mug is the aesthetic craft of the design. These are created by a talented ‘in-house’ design team and a wide portfolio of gifted freelance artists, many of whom have been associated with Dunoon for over 25 years. Further proof, if it was needed, that Dunoon understand the importance of consistency and longevity when it comes to producing top quality products. The mugs are all finished with high quality glazes, and prints guarantee accurate colour reproduction, ensuring none of the incredible detail or rich shades are lost from the original and intended design. Throughout every stage of the manufacturing process each one of their products is handled by a skilled craftsman, maintaining Dunoon's reputation of nearly 40 years of excellence in pottery making. TemptationGifts is proud to be one of Dunoon's oldest and best customers - we have been stocking Dunoon mugs ever since 1983! And it's this unique partnership that has paved the way for Temptation to be named Dunoon's Recommended Online Retailer. You can read more about our partnership by clicking here.